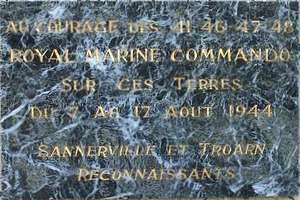 Memorials, Monuments and Plaques bearing the Combined Operations Insignia or having a strong association with Combined Operations. Please E-mail your nominations providing, in brief, whatever information you have. Scroll down or click on the links below. Subject. 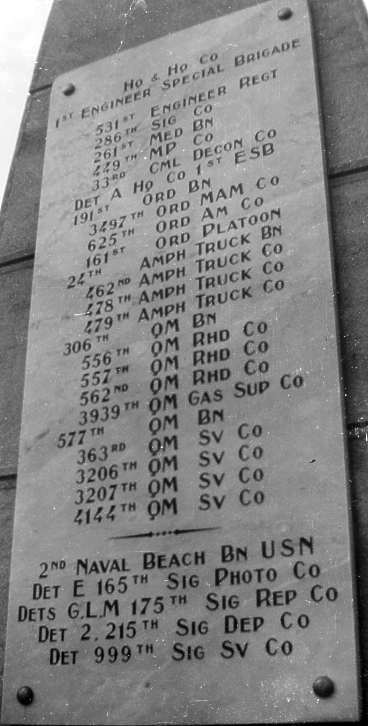 Combined Operations Command Memorial. Location. National Memorial Arboretum, Alrewas, Staffordshire, England. Other Information. 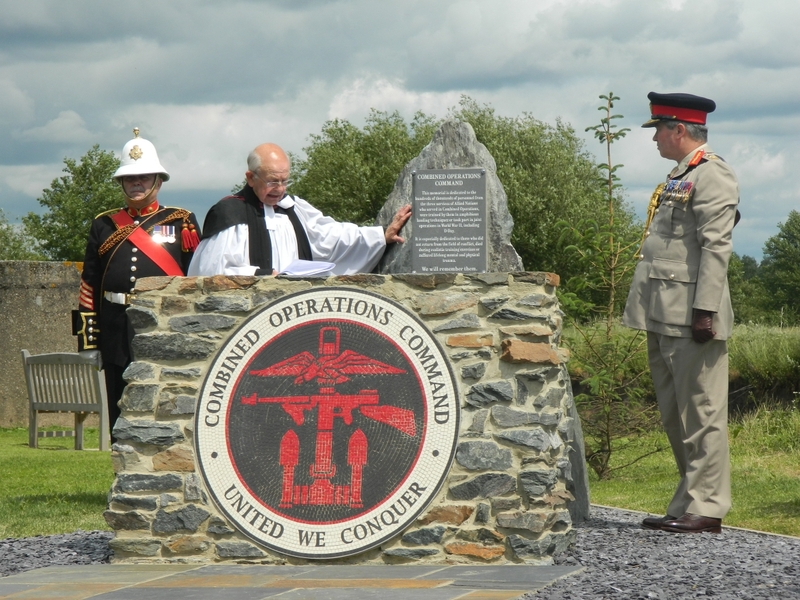 On Thursday, July 4th, 2013, in the presence of Her Majesty's Lord Lieutenant of Staffordshire , Mr Ian Dudson CBE and 200 guests, the Combined Operations Command Memorial was unveiled by General Sir Richard Barrons KCB CBE ADC Gen, Commander of the Joint Forces Command. 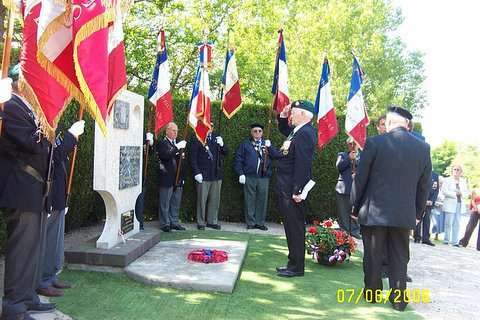 25 WW2 Veterans also attended. Subject. 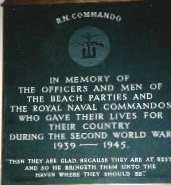 RN Commandos. No.3 R.N. 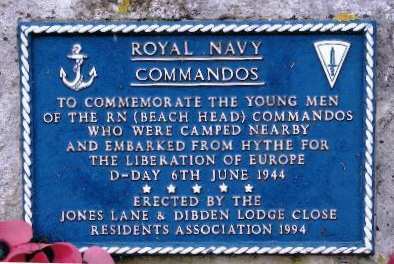 Commandos were billeted in the town of Hythe prior to embarkation for Normandy from Hythe Pier. Location. 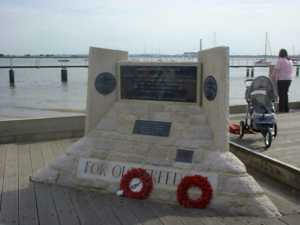 The Memorial Stone is situated in a small park close to Hythe Pier. Other Information. 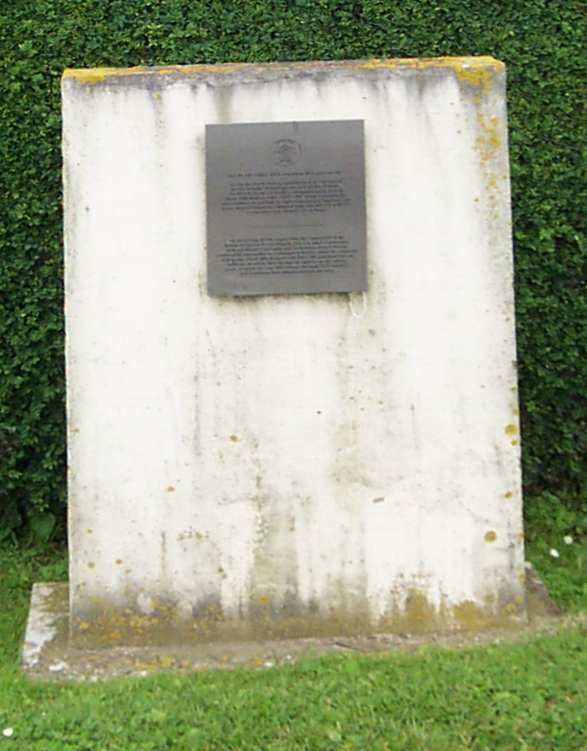 The stone was erected by the town's folk to commemorate the event. Subject. Naval Commandos. 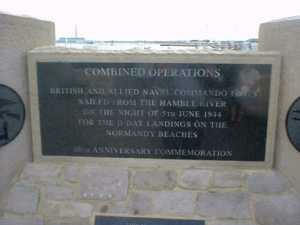 British and allied naval commando units sailed from the Hamble River on the night of 5th June, 1944, for the D-Day landings on the Normandy Beaches. Location. 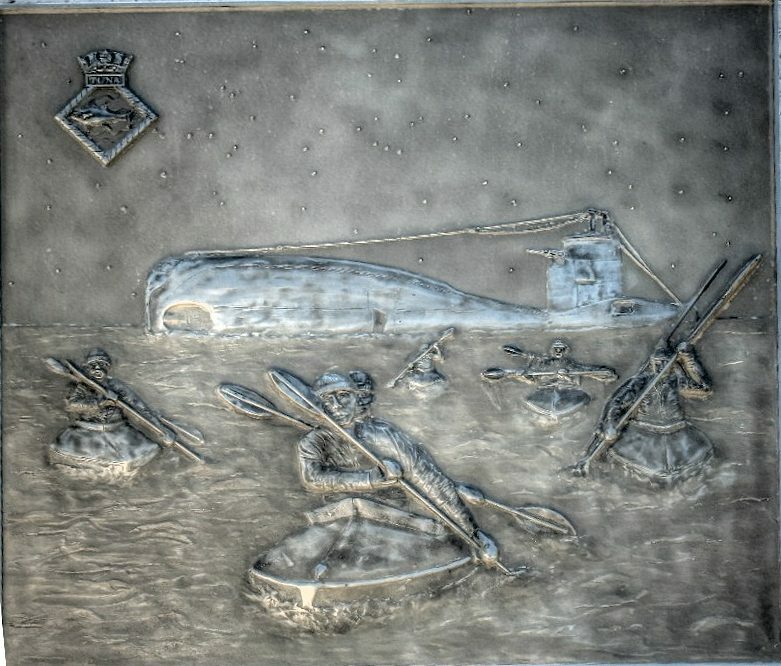 Memorial to the D-Day Landings, Warsash Pier, Warsash, Hampshire. Other Information. 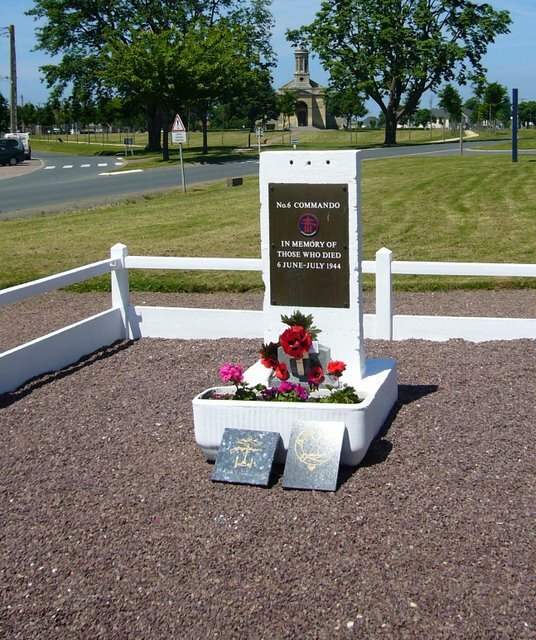 This memorial was unveiled by Countess Mountbatten, 5th June, 1984, during the 40th Anniversary Commemoration. Location. Conwy, North Wales. Follow signs for the marina. 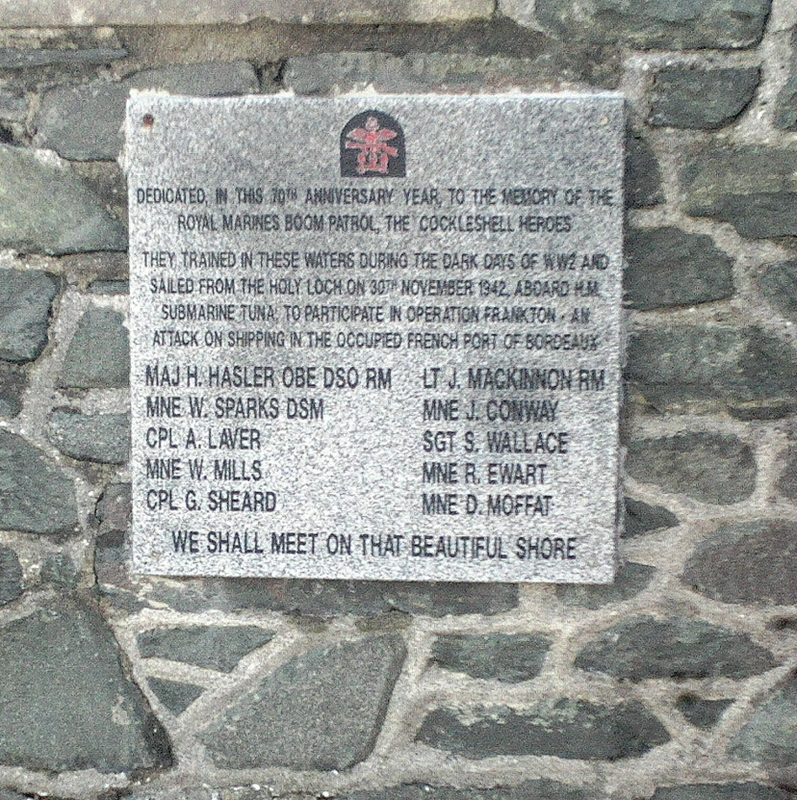 The plaque is situated in the council car park next to Conwy Marina. Subject. Operation Tiger. The disastrous USA amphibious landing training exercise in Lyme Bay involving the loss of 749 men. Location. Slapton Sands on the A 379 about 10 miles south of Brixham. Other Information. 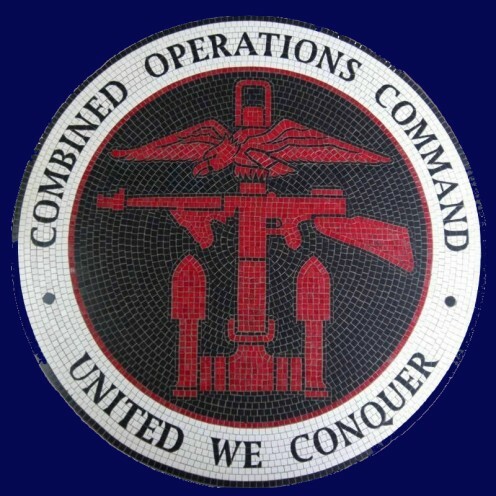 See Operation Tiger on this website. Subject. 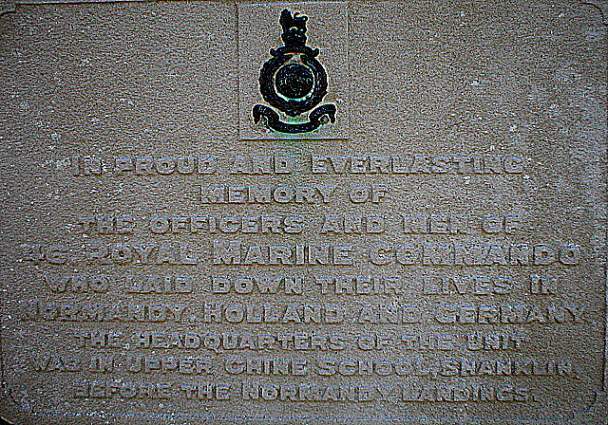 Officers and men of 46 Royal Marine Commando, whose HQ was in the Upper Chine School prior to the Normandy landings. Location. Shanklin on the Isle of Wight just through the old Village. Other Information. The building was used throughout the war and at one stage was the HQ of No.2 Commando... it was demolished in 2002. 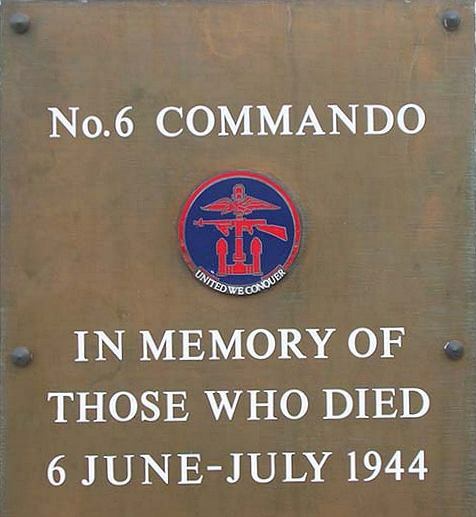 Also in Shanklin Chine, there is a cafe with lots of photographs of the commandos training in the area. It is well worth a look. See also bottom of PLUTO page. Subject. Royal Canadian Army Service Corps. Location. The New Forest close by the town of Southsea. Other Information. 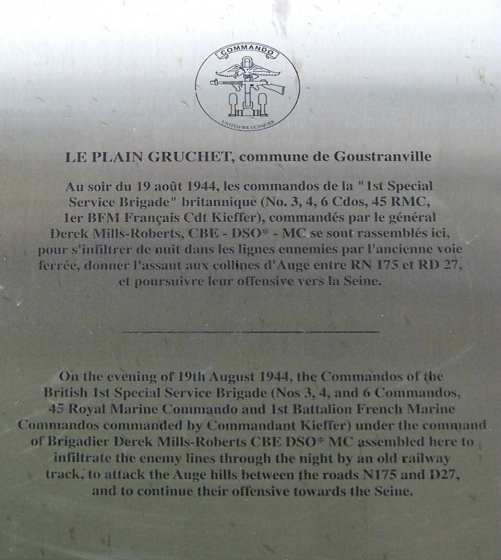 The site was occupied by the Corp prior to the D-Day landings. Subject. Royal Navy Servicemen (Walcheren). Location. St Michael's Church, Blandford Road, Hamworthy, near Poole. Other Information. 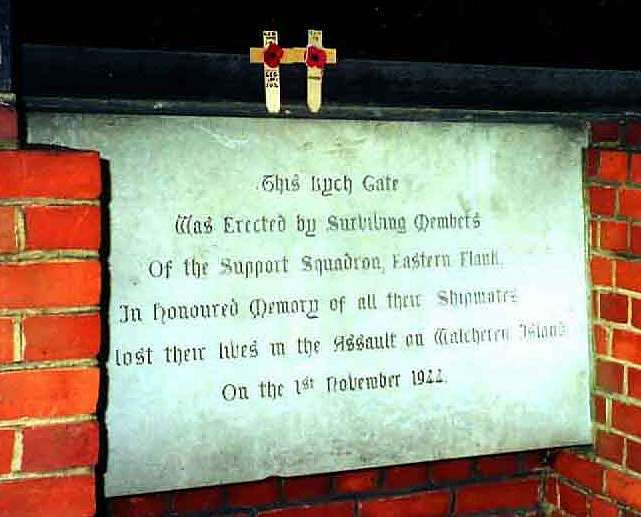 As a Petty Officer on LCH 269 (Commander Sellar's ship) for the Walcheren Operation, Basil Woolf recalls, that on return to Poole the ship's company decided to make a collection for a temporary Lych gate in a church. 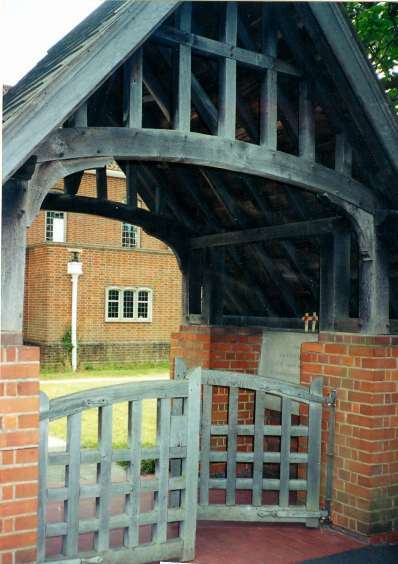 Years later, more money was obtained and a permanent Lych gate was installed on 5 July, 1952. It was unveiled by the Bishop of Salisbury. Attending, among survivors, were Admiral of the Fleet, Sir Phillip Vian, Commander Sellar and a representative of the Dutch Embassy. Subject. 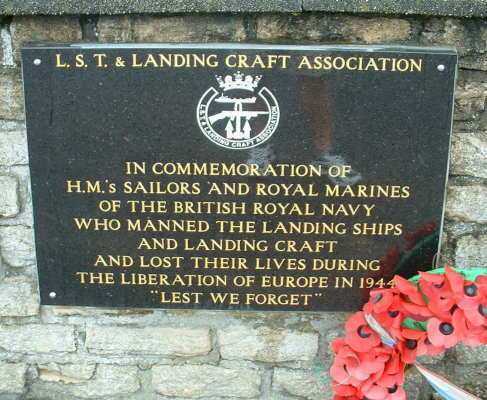 LST & Landing Craft Association memorial. Location. 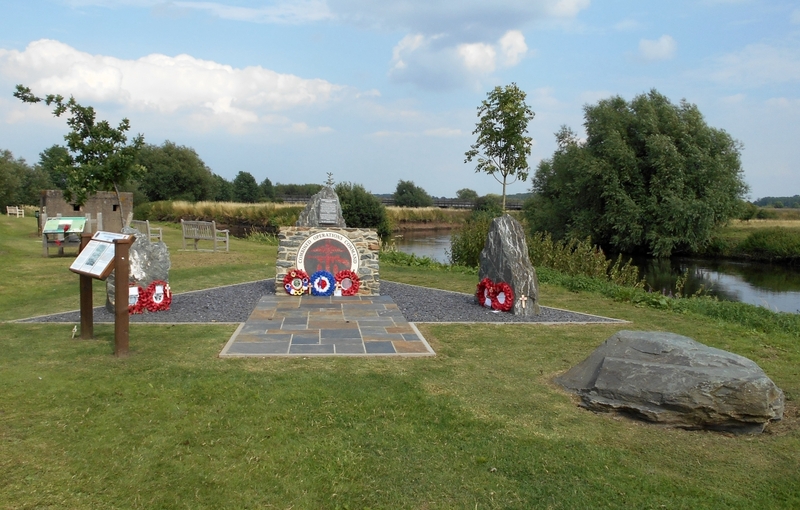 The National Memorial Arboretum in Staffordshire. Location. Spean Bridge, about 10 miles NE of Fort William on the A82 to Inverness. Other Information. 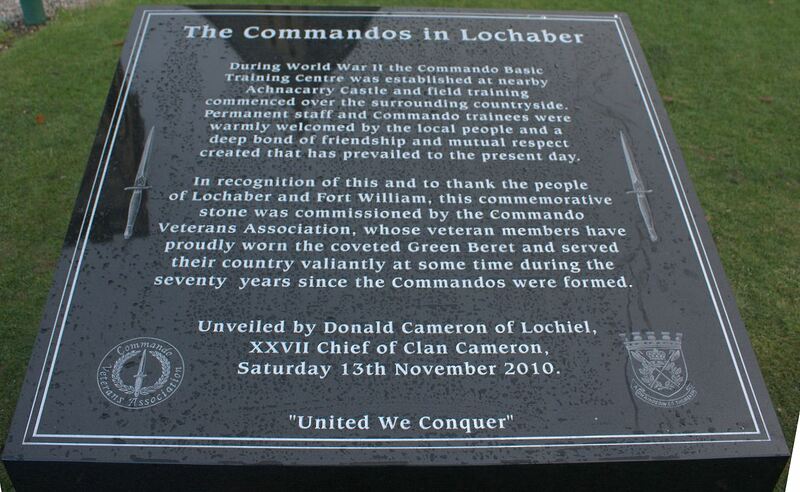 Commandos of many nationalities did much of their training in the surrounding hills and at nearby Achnacarry. 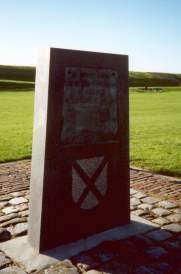 The monument was unveiled by Queen Elizabeth the Queen Mother in 1953. Subject. HMS Quebec, a Royal Navy base, part of the No 1 Combined Training Centre. Location. A few miles south of Inveraray, Scotland, on the A83, turn into the Argyll Caravan Site. Other Information. 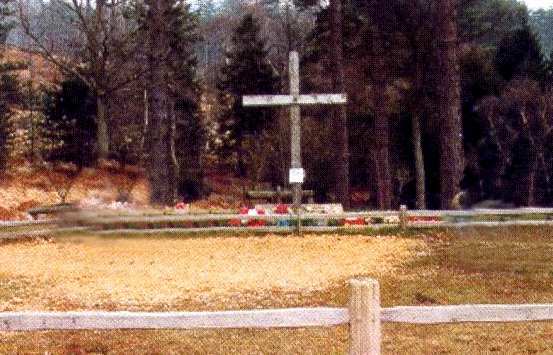 The memorial is situated near the caravan site's reception office. 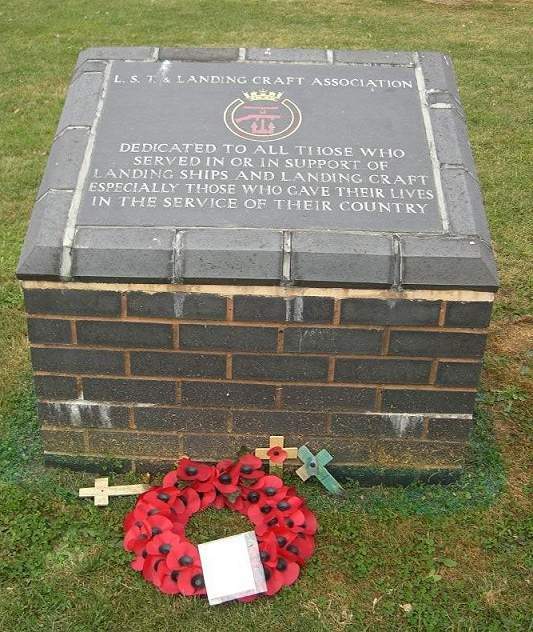 It's maintained by the Royal British Legion. Location. 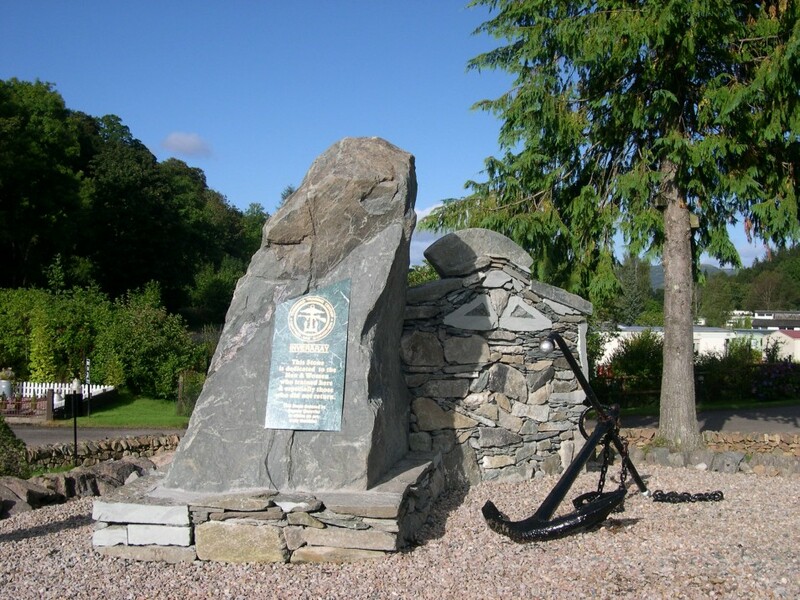 The memorial plaques on the left are situated in Ardentinny Church on Loch Long in Scotland, close to where the RN Commandos training base at HMS Armadillo was located. Location. 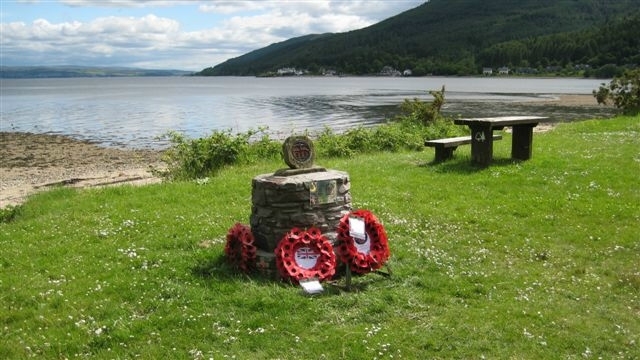 The memorial cairn is near the village of Ardentinny on the shore of Loch Long in Scotland, where the RN Commandos training base at HMS Armadillo was located. Other Information. 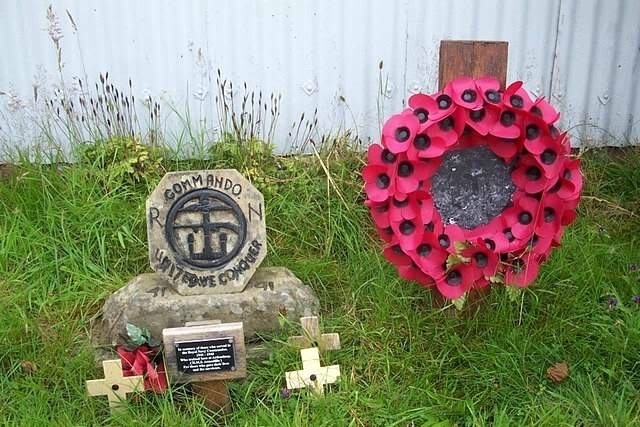 On the 15th of February, 2001, Ken Oakley, Chairman of the RN Commando Association, wrote to Tommy Hamilton "Ted Hinchcliffe made the memorial stone (crossed the bar Jan 01). He was very proud of making it out of Yorkshire stone". In the same letter, Ken asked Tommy if he would paint in the letters, which he did. His son, David, subsequently refreshed the lettering. 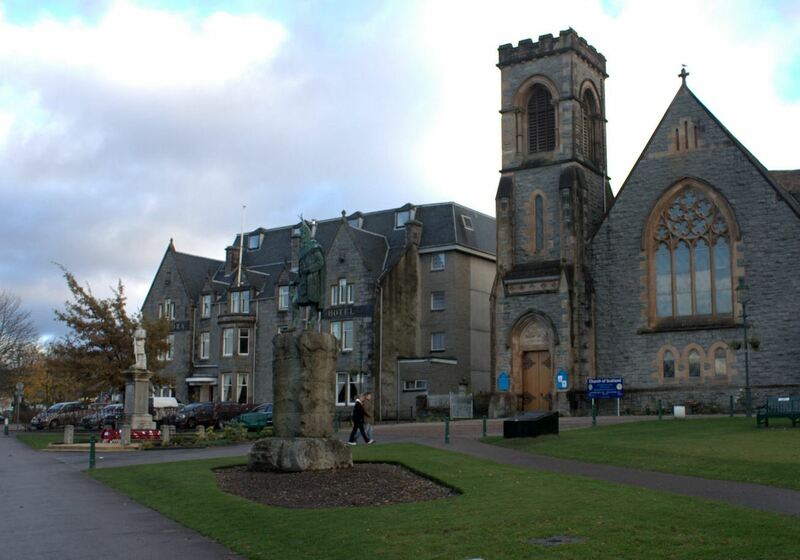 The memorial stone was originally placed outside the front door of the old Forestry Commission (FC) office. When the building was demolished, Ian Adams of the FC, moved the stone to a safe location about 30 metres away. 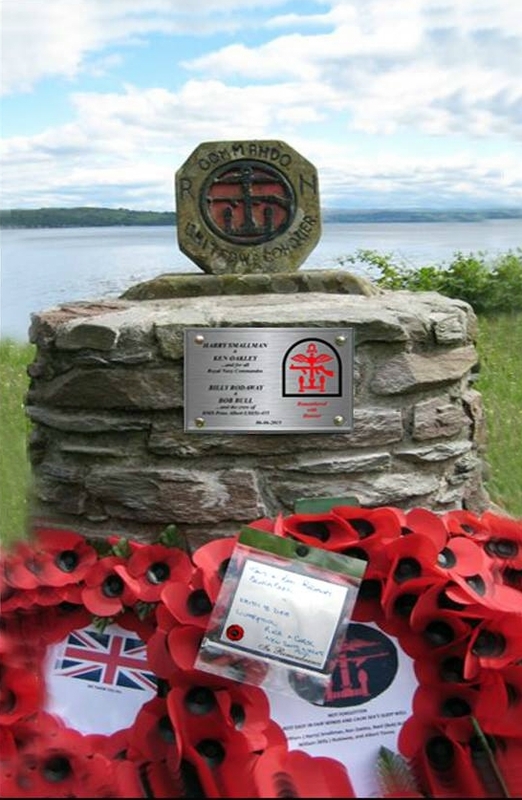 The cairn, seen in the photos above, was built by FC workers, Stephen Cooper and Ben Blowers in time for Remembrance Sunday, 2013. Location. 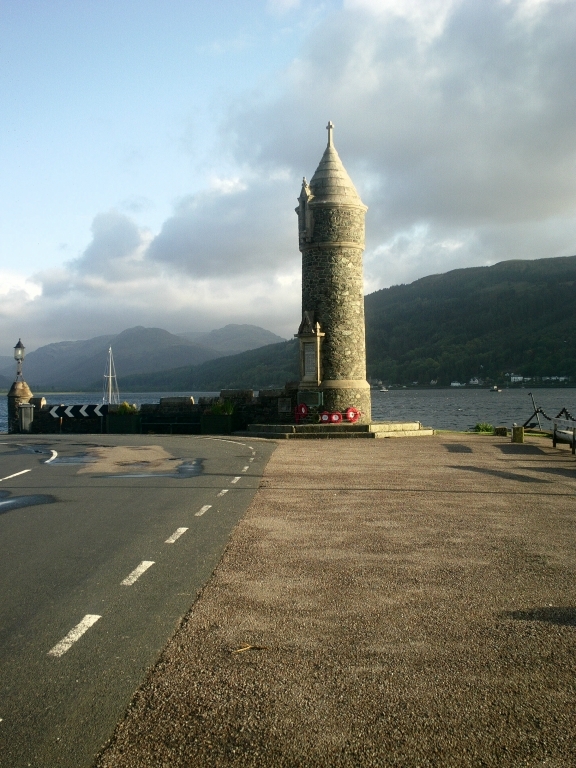 Near Fort William town centre on the Parade close to the War Memorial. Subject. 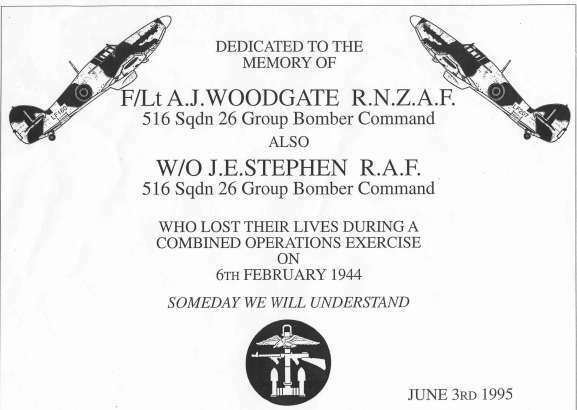 The Loss of Two Hurricane Pilots, while taking part in a combined training exercise. Location. Ardnamurchan Peninsula, Scotland (see map). A long walk over rough terrain is involved. Subject. Operation Chariot - the raid on the dry dock at St Nazaire. Location. St Nazaire, France. 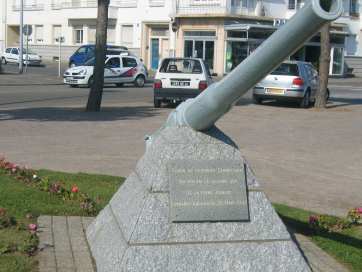 The memorial and the 12 pounder gun, taken from HMS Campbeltown, are situated side by side at Place du Commando, which is at the eastern end of Boulevard President Wilson. Other Information. 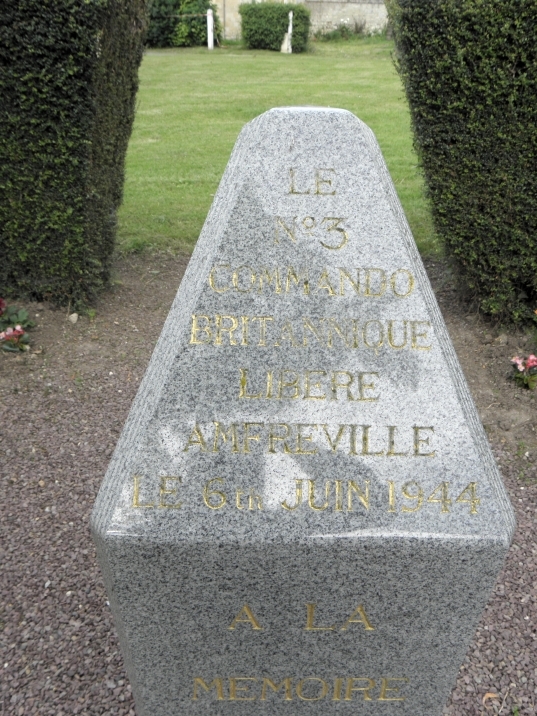 The inscription below the gun reads 'Canon du destroyer Cambeltown qui percuta le caisson sud de la forme joubert Commando Anglais du 28 Mars, 1942'. Click here for more information on Operation Chariot. Photos courtesy of Graham Francis. Subject. The Operation Frankton Memorial to the Cockleshell Heroes. More information here. Other Information. Taken after the dedication ceremony on 31/03/11, courtesy of Eric Lincontang. Subject. US 1st Engineer Special Brigade. 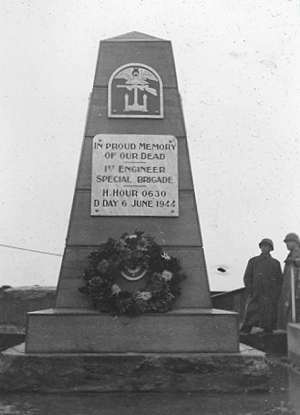 The inscription reads; In proud memory of our dead. 1st Engineer Special Brigade. 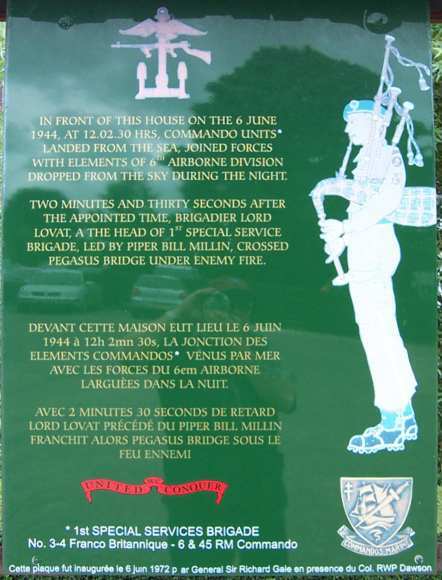 H Hour was 6.30 hr on D Day, 6th June, 1944. Location. 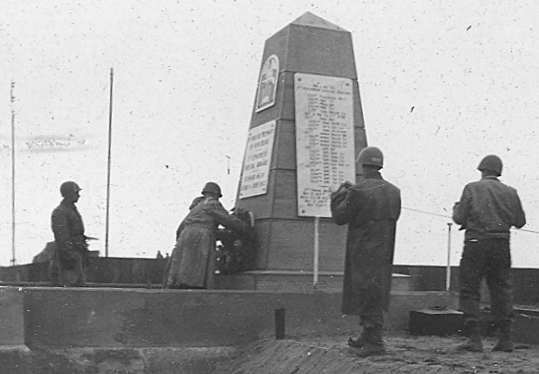 It is known that some memorials were constructed during, or shortly after, WW2 as per this explanation by Charles B MacDonald, a former deputy chief historian at the US Army's Center of Military History. 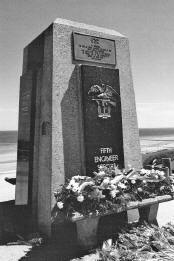 Soon after the end of the war, veterans of the 1st Engineer Special Brigade, which incurred the heaviest losses in Exercise Tiger, did just that, erecting a monument on Omaha Beach (now known to be Utah Beach - see below) to their dead, presumably to include those who died at Utah Beach and those who died in preparation for D-Day. 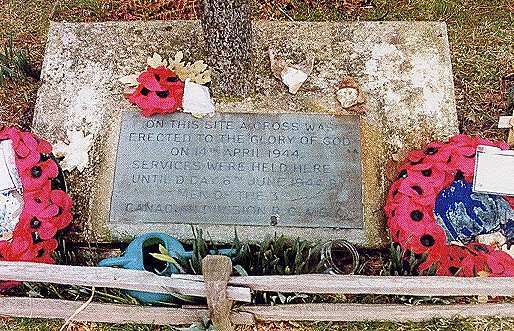 One source indicates that the memorial was unveiled in June 1945. Other Information. One visitor writes... My father was part of that unit. He camped near that spot on the beach. There's an interesting book called Storming Ashore, by Kenneth Garn (available on Amazon) about the 1st Engineers Special Brigade. The book notes that the monument was on the site of one of the first German machine gun pillboxes seized on Utah Beach on D-Day. A number of years ago I visited Utah beach. And there it was. It was part of our family history to show children photographs taken when we were at Utah. Subject. The action to take Pegasus Bridge. Location. 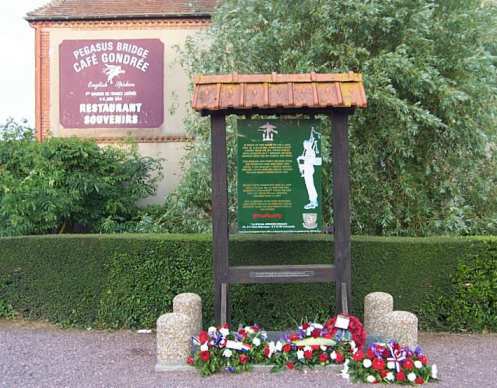 The Cafe Grandee near Pegasus Bridge. Subject. 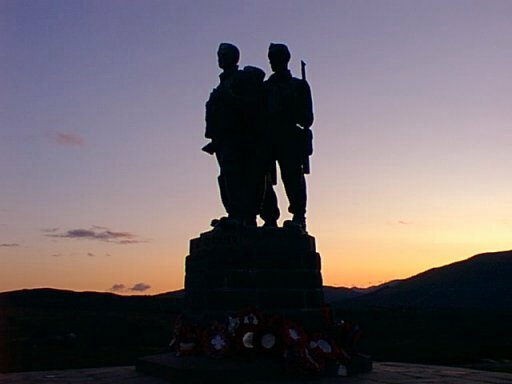 No 3 Commando Memorial. Location. Le Plain / Amfréville. Subject. 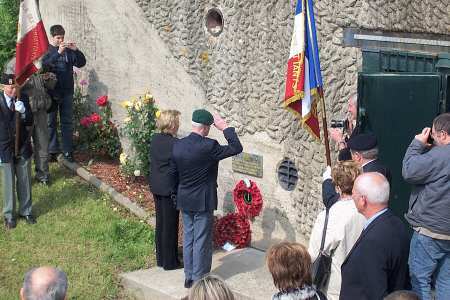 No 3 Commando action at Merville Battery. Location. 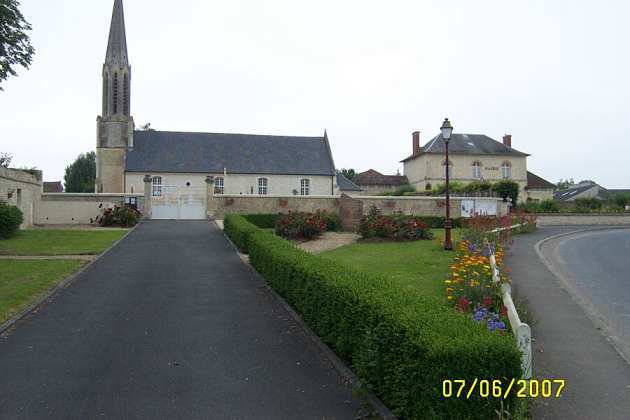 In Normandy near the village of Merville-Franceville on the D514. Subject. 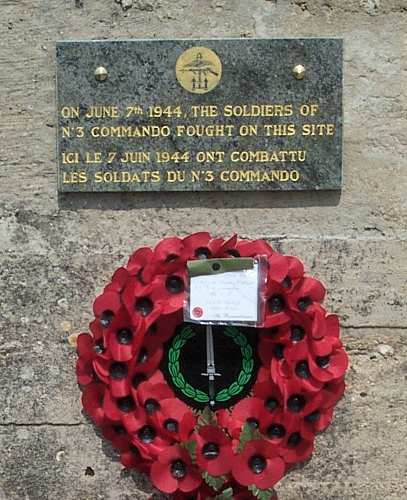 No 3 Commando 1st Special Services Brigade. Location. Amfreville - in the town centre near the church. Other Information. Photos provided by Bern & Fay Robins. Subject. 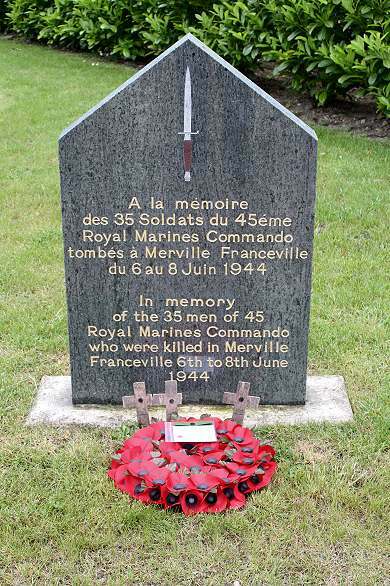 45 Commando, who were killed on the 6th - 8th June, 1944, at Merville Franceville. Location. 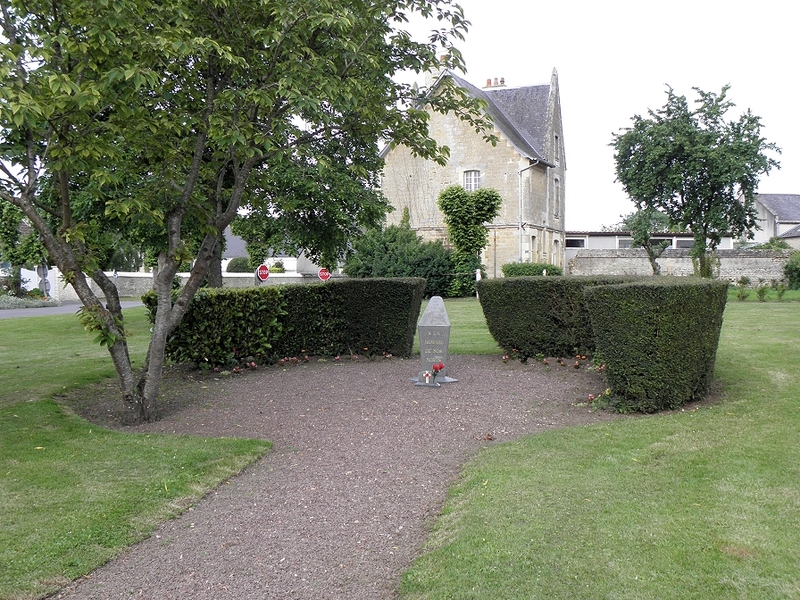 Next to the Mairie at the roundabout up to Merville Battery, junction of Route de Cabourg (D514) and Avenue Alexander de Lavergne. Other Information. Michael Partington writes; My dad is Graham Partington, temp Lt, ex B Troop 45, RM Commando, 1944-47. 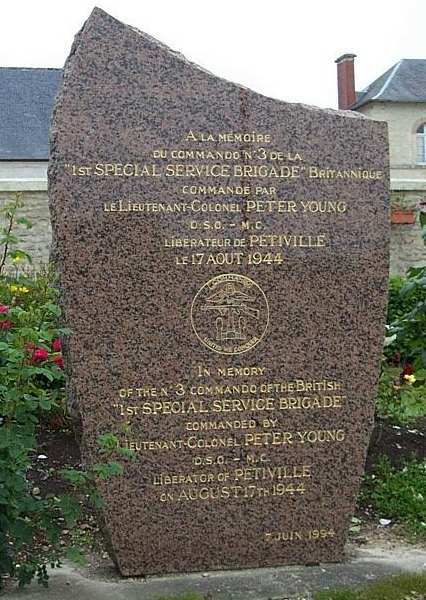 He was with No1 Special Service Brigade on D Day and was with 45, when they crossed the Rhine at Wesel in 45. 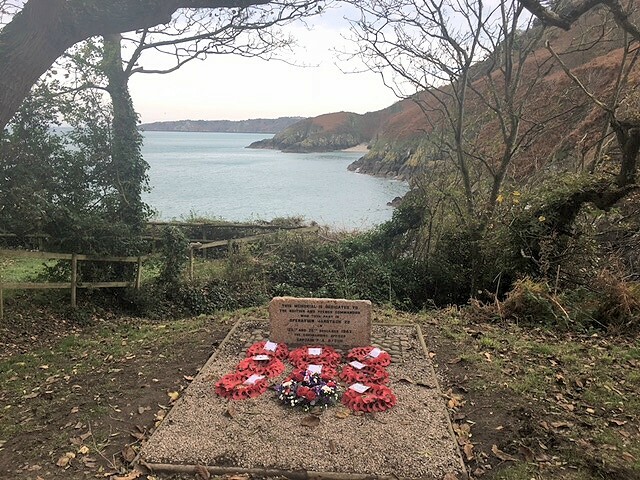 I recently visited the memorial and placed a wreath on behalf of my dad. The memorial is beautifully kept but it does not seem well visited. 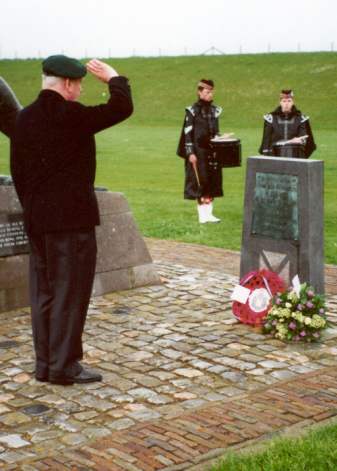 A wreath, laid over 12 months earlier, was still in position. It may just be that it is not well known. Location. 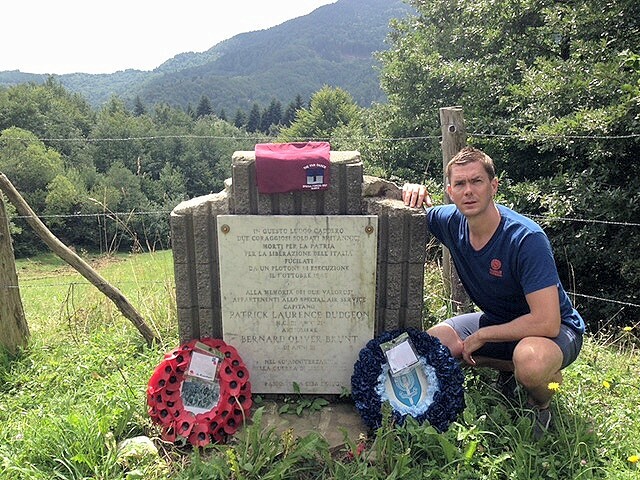 at Sannerville a few miles east of Caen. Other Information. The mason was Auvray Djonny and the Architect Marcel Conti. Subject. Commando Action in the area of Le Plain Gruchet. Location. Goustranville, near the Auge Hills, between the N175 and D27 Roads. Subject. The Royal Canadian Army Service Corp (RCASC), who served on D-Day and in the Battle of Normandy. Location. 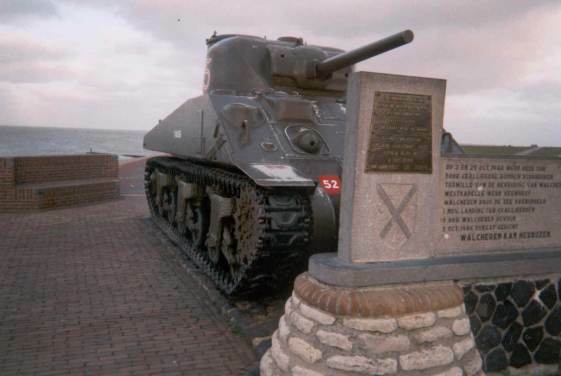 The “BOLD” tank in the town square of Courseulles-sur-Mer, Normandy, France. (Juno Beach). Other Information. 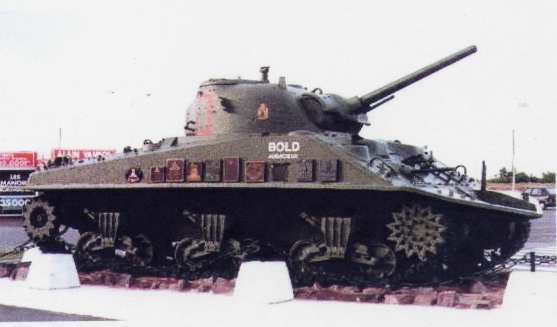 This Sherman tank, of the 1st Hussars nicknamed 'Bold,' sunk on D-Day and was pulled from the water in 1971 (with the assistance of 4 Service Bt). 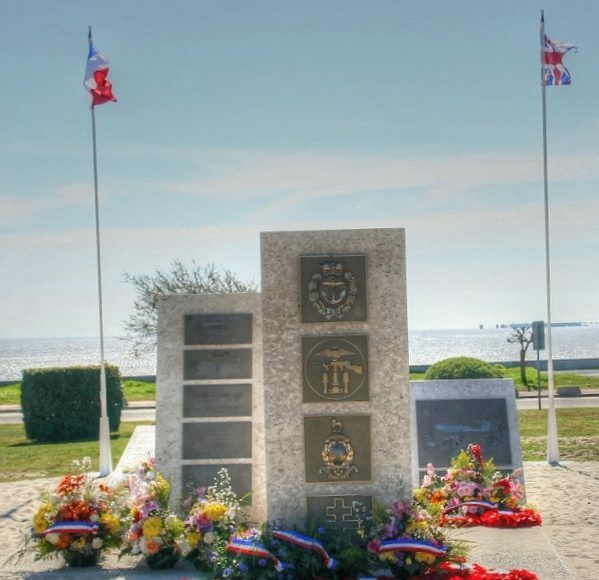 It was restored and over the years bronze plaques have been added, commemorating the Canadian units, regiments and corps, which took part in the landing. 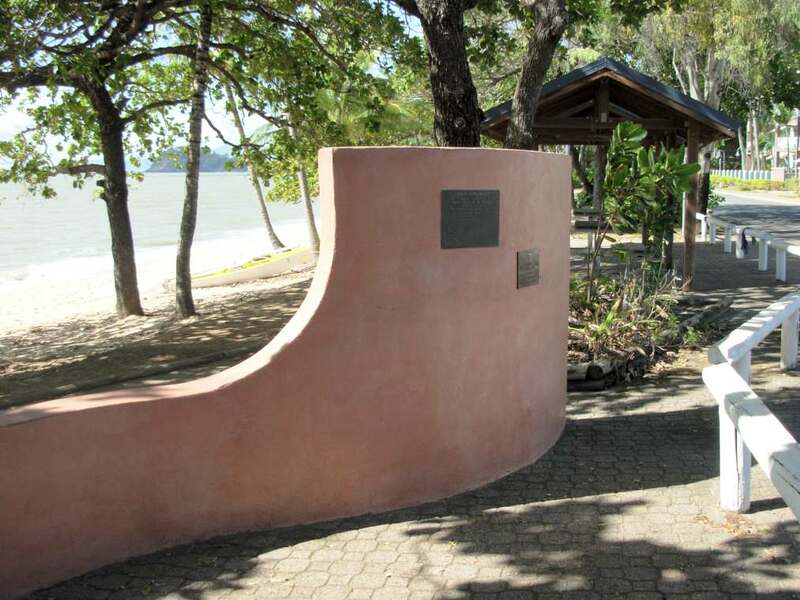 The plaque was unveiled on 7 June, 2004. Subject. US 5th Engineer Special Brigade. Other Information. 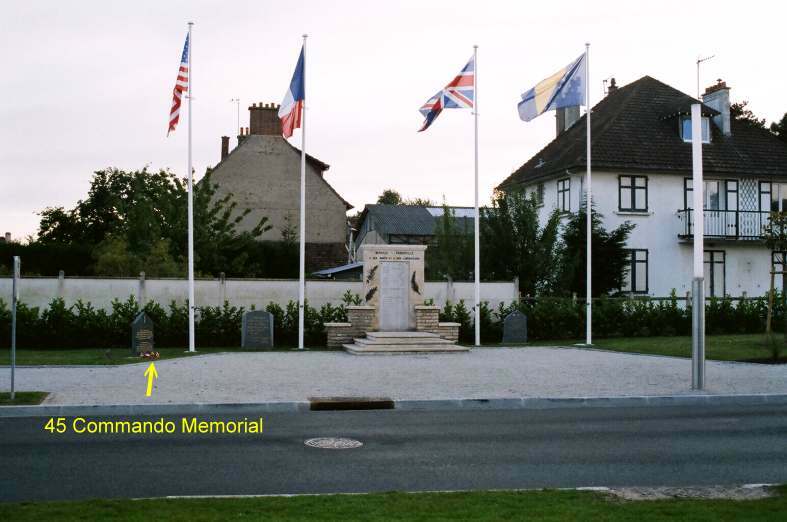 Tom Bryan writes from the USA; The photo is of the recently refurbished monument. A few years ago the (British) Combined Ops/(American) Amphibious insignia was stolen, so this year a few members of our group, the 348th Family & Friends, had a new emblem made. They met in France a few days prior to the D Day ceremonies and installed the insignia and made some repairs to the monument. An unveiling ceremony was held on June 5, which was attended by about 300. Subject. Crews of Landing Craft and Landing Ships. 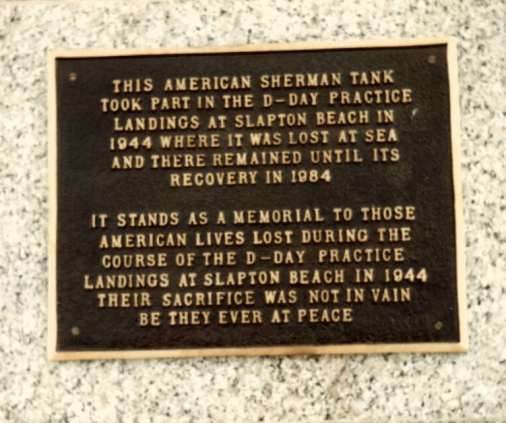 who died in action off Normandy. Subject. The landing of the 52nd Lowland Division on 1st Nov, 1944 against entrenched German defensive positions. Location. 'Uncle Beach' Vlissingen, Walcheren Island, Scheldt Estuary, Holland. Other Information. 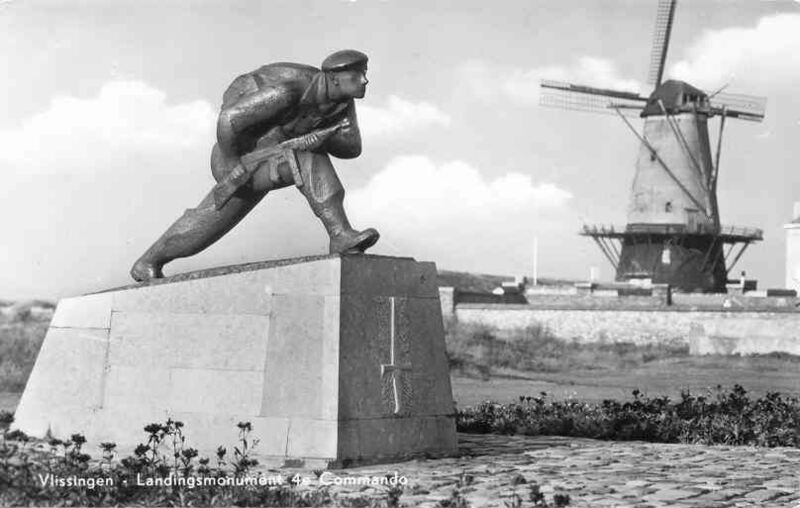 The heavily fortified island blocked the River Scheldt to Allied shipping and thereby to the newly captured Antwerp. Full story on this link; Walcheren. Subject. 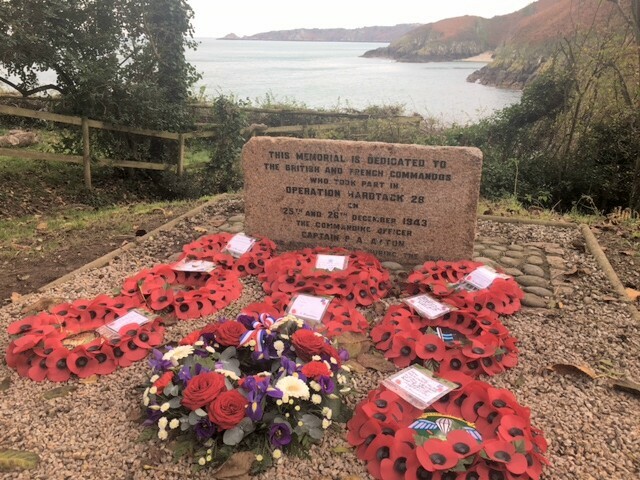 The landing of No 4 Commando Brigade*on 1st Nov, 1944 against entrenched German defensive positions. Location. Westkapelle, Walcheren Island, Scheldt Estuary, Holland. Location. Flushing, Walcheren Island, Scheldt Estuary, Holland, near the Orange Mill (where they landed). Other Information. 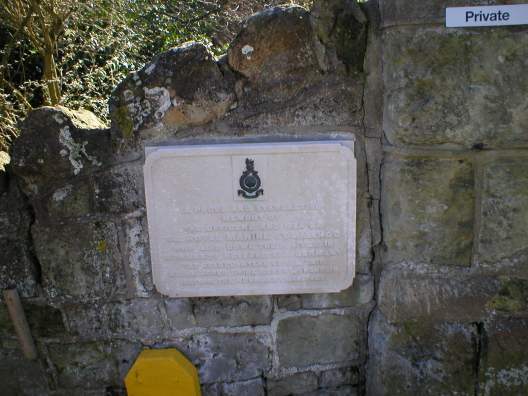 The original plaque attached to the monument is not in place in this photo (left) but the text can be seen in the photo (right). 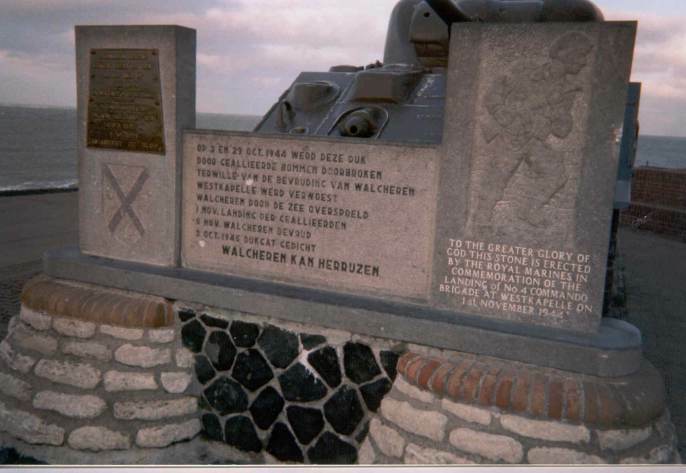 Full story on this link; Walcheren. Subject. 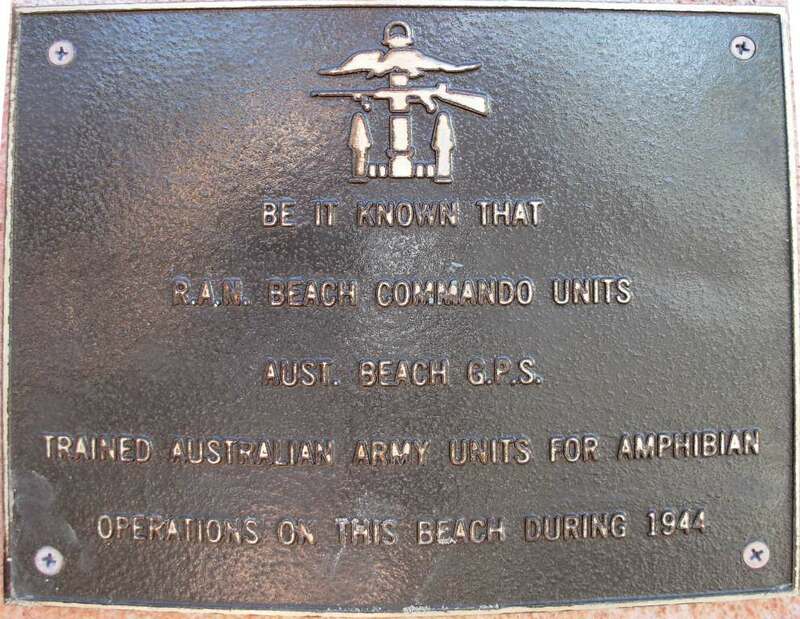 The Royal Australian Navy Beach Commando. Subject. Canada; The site of WW2 Combined Operations Training. Location. 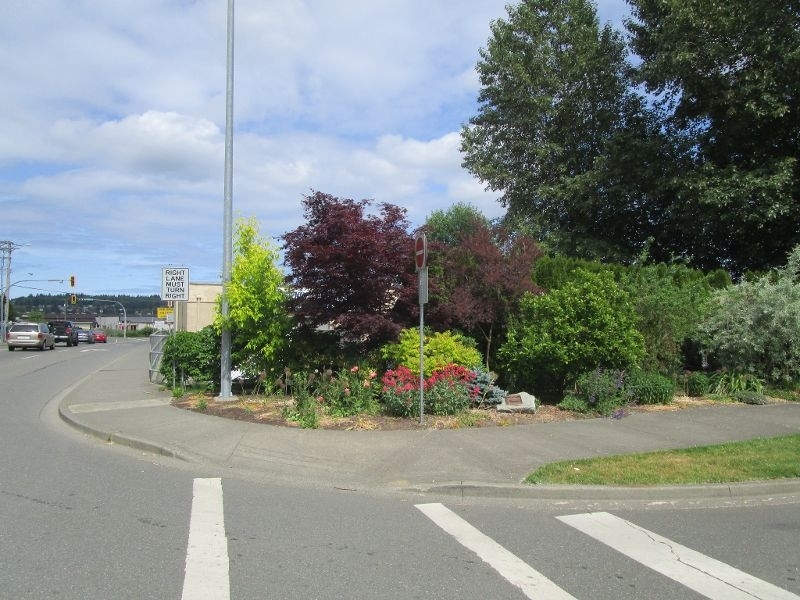 CANADA: Courtenay, Vancouver Island, British Columbia. 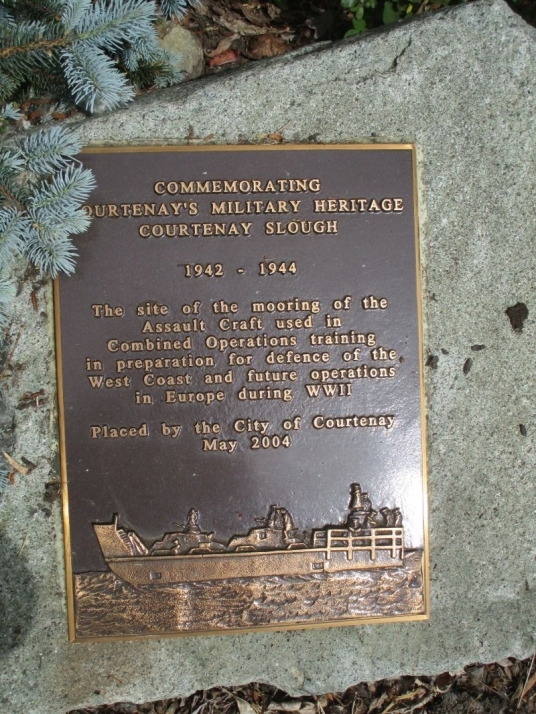 At Simms Millennium Park, in Courtenay, a large display board provides details of the park, including a bit of history of the area associated with Combined Operations. Other information. Initially, the training and provision of landing craft was a defensive measure, at a time when invasion of the Canadian west coast, by Japanese forces, was a distinct possibility. Later the emphasis turned to the European theatre of war. Subject. The construction of top secret experimental "ice ships" in 1943. Location. CANADA: Patricia Lake, Jasper, Alberta. A few miles outside the town. Other information. 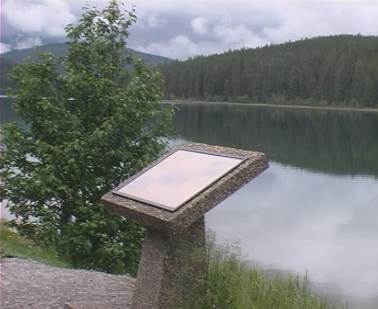 Plaque was erected by the National Research Council of Canada in 1989. More information on this site at Pykrete - Ice Ships. Location. CHANNEL ISLANDS: Jersey, Channel Islands. Other information. 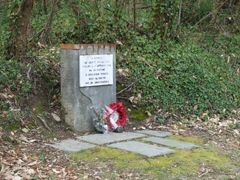 On 25/26 December, 1943, a team of eight from No 8 French Troop of No 10 Inter-Allied Commando and No 12 Commando landed on Jersey to take a sample of barbed wire and to capture prisoners. 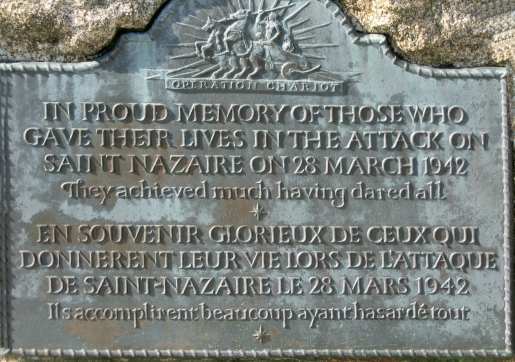 They landed at Petit Port, climbed the cliff but failed to locate a German soldier. On their return to the beach, a mine was set off, seriously injuring Captain Ayton who sadly died of his wounds back in England. Subject. 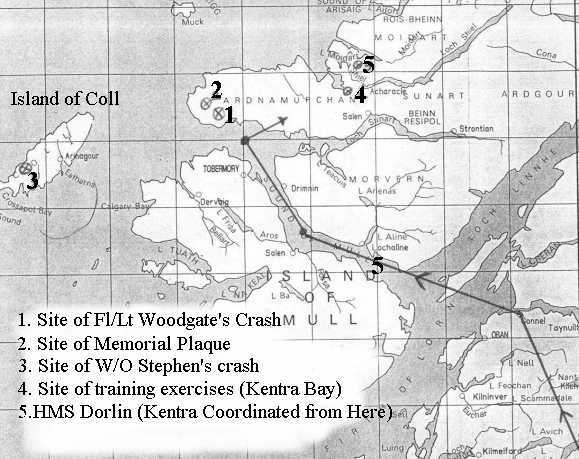 SAS Operation Speedwell, September 7, 1943. Other information. 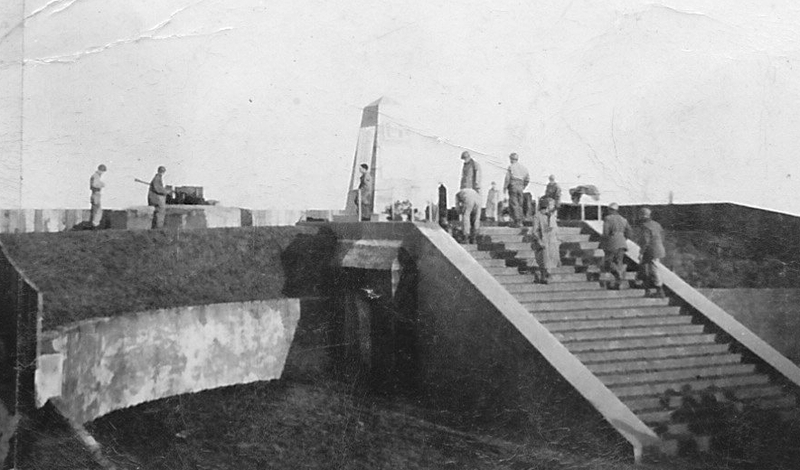 Operation Speedwell was designed to disrupt transportation of military supplies from the Po valley to the German front lines at Salerno, Calabria and Taranto. Six SAS operatives parachuted into Italy on what was a high-risk operation that met with only limited success. 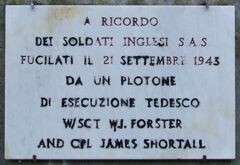 Foster and Shortall were captured and executed at Ponsano Magra.